GLENDALE, Colo. – Motivated by a runners-up result in the Women’s D1 Elite Final, Lindenwood University completed an undefeated 2017 USA Rugby College 7s National Championship campaign with a 31-12 defeat of Life University Sunday in the Women’s Open Division Cup Final. The Lions and Running Eagles split sevens results earlier in the spring prior to a D1 Elite Semifinal meeting May 6 in Marietta, Ga. Lindenwood’s day of knockouts was built around defense as the Lions dispatched University of Michigan and Central Washington University in shutout fashion while Life was taken to the wire by DI 15s Spring Champion University of California, Davis, in a tight Quarterfinal. In the second minute of the Cup Final, Dimeken Paogofie-Buyten intercepted a Life pass in the Running Eagles’ defensive half to turn play the other way before feeding capped Women’s Eagle Annakaren Pedraza with the assist for 5-0 lead. Life had one try reviewed and disallowed moments later before taking a sixth-minute lead, but Lindenwood’s Hannah Gauthreaux – named Most Valuable Player of the competition – dotted down after the first-half whistle for a 12-7 advantage at the break. All-Americans McKenzie Hawkins and Natalie Kosko ended Life’s hopes with three tries between them in the second half for a 31-7 deficit that turned into a 31-12 final score. “[Our message was to] out-perform the person in front of us and leave it all out there,” Gauthreaux said. “The depth definitely helped us. We got to rest a couple of starters in the Semifinal and having that depth gives us the confidence in a long, six-game weekend. Central Washington University, runner-up at the 2015 National Championship event in Denver, lost just one game in pool play Saturday and earned a spot in the Cup Semifinals with a come-from-behind win against Army West Point in the Quarterfinal. Lindenwood was too much for the Wildcats, however, with the Lions crossing the try line three times in a 21-0 shutout. Dartmouth College, loser to Life after putting 2015 Champion Pennsylvania State University to the sword in the Quarterfinals, found itself on the receiving end of a blanking in the Bronze Final to Central Washington, 31-0. 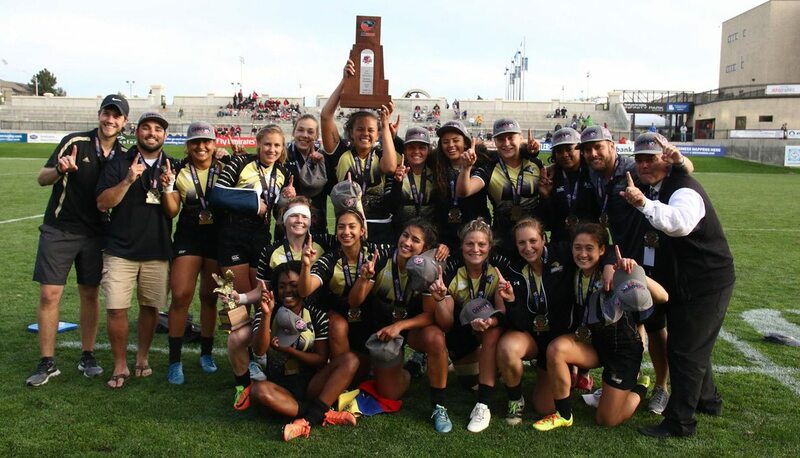 Last year’s women’s competition was split between Divisions I and II, with Davenport University beating all comers to pair its DII 15s Championship with a College 7s trophy. The Panthers had the same idea this year following their protection of the 15s Fall and National Championships, but could not find their footing in pool play to miss the Cup competition completely. They found the win column Sunday, however, beating Montana State University and Princeton University to win the Bowl. The Bobcats of Montana State rebounded to finish off the day with hardware, beating Texas A&M, 10-0, for the Shield.